WEST Coast has somehow held Melbourne at bay to win a game it had no right to win and remain in the race for the top four. The Demons will kick themselves all the way back to Melbourne after butchering an opportunity to register their first win at Domain Stadium since 2004. They have now lost their last 17 at the venue and their last nine against the Eagles. The Demons failed to kick a goal in the last quarter despite 17 entries to nine while the Eagles were perhaps fortunate to find two goals, one coming from a line-ball deliberate out of bounds decision. The Eagles registered their lowest time in forward half differential at home, spending only 37 per cent of game in their front half. "Melbourne were terrific today, but we won," Eagles coach Adam Simpson said post-match. "We'll take the win. We have a lot to work on. But if we can't enjoy the wins, we're in the wrong business. "We're really clear on where we're at and what we have to do. I was actually pretty happy with how we handled the last quarter. We fought it out." Melbourne coach Paul Roos agreed with Simpson that his side should have won the game. "We won in every (stats) category," Roos said. "I think their experience at times and our inability to connect - some of the ball movement was really good and then we kicked to the opposition. "Just key moments in the game and obviously inaccuracy - 3.6 in the third quarter makes it difficult. "But we're a young team and to come over here off a six-day break and play a team like that and win in every category, we should have won the game. From our point of view it's a harsh lesson for the guys. Hopefully we'll learn from it." Matt Priddis did a power of work in the midfield with 24 disposals and 15 tackles. 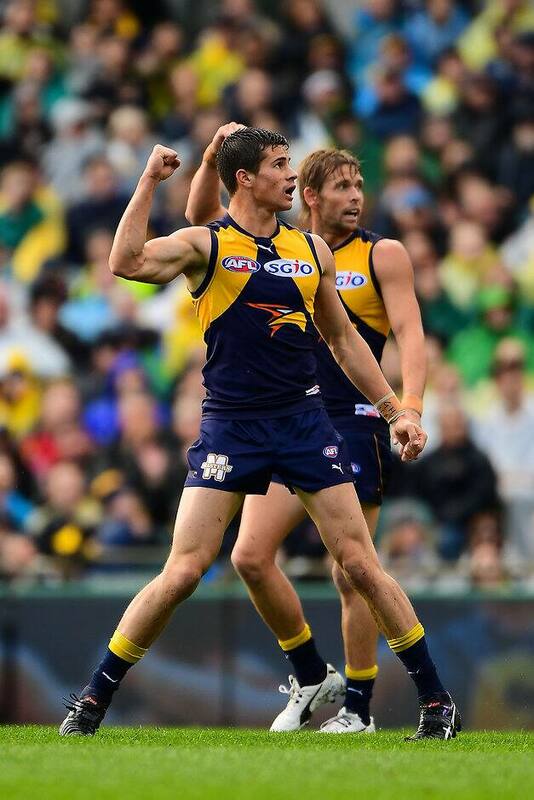 Andrew Gaff and Luke Shuey had big last quarters. Gaff gathered 10 disposals and kicked a goal in the final term to finish with 26 disposals for match. Josh Kennedy kicked three goals while Jeremy McGovern was resolute in defence again. Jack Viney, Nathan Jones and Dom Tyson were a huge part of the Demons' engine room that dominated the day. Christian Petracca was impressive throughout while Max Gawn was very influential and got better the longer the day went on. Jeff Garlett kicked three important goals and Chris Dawes two, but it was the opportunities the Demons missed that will haunt them. The wet weather played into Melbourne's hands. It rained heavily in the first half and the Demons got their hands dirty. They smashed the Eagles in the contest. They won the contested possession count by 17, but they were 20 in front at half-time. They also won the tackle count by 15. "We got beaten up around the ball," Simpson said. "They have four or five really good hardened inside mids and they are young. We rotated guys through there but couldn't find the right match-up to get that ball out." It was five consecutive behinds in the third term as the Demons dominated with repeat entries that hurt them the most. They led by just two points at half-time but kicked 3.6 to 3.2 in the third term. They also had some chances in the last quarter. Jack Watts hit the post with a snap that would've seen the Demons reclaim the lead late in the match. Dawes kicked another out of bounds on the full. "It was just the key moments," Roos said. "The execution of kicking for goals in the third quarter, even Wattsy's one that hits the post, Dawesy misses completely. "Just those moments that really hurt us." The Eagles overused the ball in wet conditions and gave up a number of scores from mistakes in the back half. "We didn't react to the conditions as well as we should have, from a strategic point of view and our players as well," Simpson said. But they have now won five games in a row and somehow remain in contention for the top four. West Coast: Sharrod Wellingham copped a corked hip in the opening turn. He battled on but he was sore throughout the match. "He copped a big corky," Simpson said. "I'm hoping that's the reason why he butchered the ball so much. We need to have a chat about that." Melbourne: Oscar McDonald limped off in the third term and went to the rooms. He returned in the last quarter but he replaced Neville Jetta who limped off with a left knee issue. He came back following some treatment. The Eagles head to the MCG for the second time in three weeks to take on Collingwood on Saturday afternoon. The Demons head home to face Gold Coast at the MCG on Sunday.